SNP leader Alex Salmon addressed the crowd during the event. 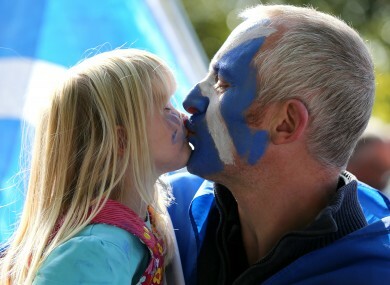 Scottish Independence supporters Alec and daughter Lena Forbes from Wick attend a rally for Scottish Independence in Princess Street Gardens, Edinburgh. MORE THAN 100,000 people have signed a declaration calling for Scottish independent, First Minister Alex Salmond revealed today. Speaking to a crowd of thousands at a rally in Edinburgh, the Scottish National Party leader said the Yes Declaration signatures have been gathered since May. Today’s event was an independently-organised demonstration attended by a number of groups. Speakers included former MPs, journalists and human rights lawyers. The Yes Scotland campaign hopes to sign up one million supporters by the time of the referendum on independence in autumn 2014. Salmond told those attending that “the most popular option for Scotland’s future is for the Scottish parliament to make all the decisions, instead of leaving vital powers over the economy, social welfare and pensions in the hands of the Tories at Westminster”. Email “Thousands attend Scottish independence rally”. Feedback on “Thousands attend Scottish independence rally”.